Yesterday’s small gain was still not enough to pare the losses over the past week for the Dow (DIA). 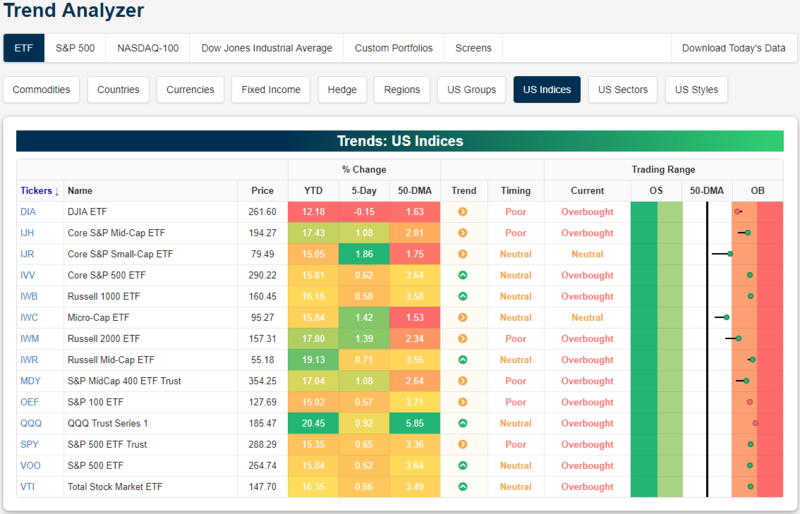 DIA is still the only one in the red in the past week and is underperforming the rest of the major indices by an increasingly wide margin. While DIA is up just over 12% YTD, every one of its peers is up at least 15%, with the Russell Mid Cap (IWR) now up 19.13% and the Nasdaq (QQQ) up over 20%! Small caps have begun to pick up the pace. While still at neutral, the Core S&P Small Cap (IJR) and Micro-Cap (IWC) are up the most in the past week. IJR is up the most at 1.86%. The rest of the major indices are still overbought with many still on the cusp of extreme levels as they have been for the past few days. Start a two-week free trial to Bespoke Premium to access our interactive Trend Analyzer and much more.